The klieg-lighted Tokyo Trial began on May 3, 1946, and ended on November 4, 1948, a majority of the eleven judges from the victorious Allies finding the twenty-five surviving defendants, Japanese military and state leaders, guilty of most, if not all, of the charges. As at Nuremberg, the charges included for the first time "crimes against peace" and "crimes against humanity," as well as conventional war crimes. In a polemical account, Richard Minear reviews the background, proceedings, and judgment of the Tokyo Trial from its Charter and simultaneous Nuremberg "precedent" to its effects today.Mr. Minear looks at the Trial from the aspects of international law, of legal process, and of history. 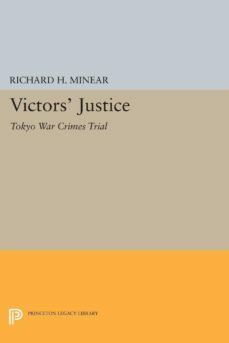 With compelling force, he discusses the motives of the Nuremberg and Tokyo proponents, the Trials prejudged course—its choice of judges, procedures, decisions, and omissions—General MacArthurs review of the verdict, the criticisms of the three dissenting judges, and the dangers inherent in such an international, political trial. His systematic, partisan treatment pulls together evidence American lawyers and liberals have long suspected, feared, and dismissed from their minds.Contents: Preface. I. Introduction. II. The Tokyo Trial. III. Problems of International Law. IV. Problems of Legal Process. V. Problems of History. VI. After the Trial. Appendices.Originally published in 1971.The Princeton Legacy Library uses the latest print-on-demand technology to again make available previously out-of-print books from the distinguished backlist of Princeton University Press. These paperback editions preserve the original texts of these important books while presenting them in durable paperback editions. The goal of the Princeton Legacy Library is to vastly increase access to the rich scholarly heritage found in the thousands of books published by Princeton University Press since its founding in 1905.